One of the premier luxury destinations in the world, Santorini is arguably the most popular Greek island vacation spot for a romantic vacation. The Santorini Caldera, a site of fascinating beauty that developed after a volcanic explosion in the 2 nd millennium BC, will certainly enchant you with its white-washed houses literally hanging from the multi-colored cliffs. The villages of Oia, Fira, Imerovigli and Pirgos provide the ideal setting for an unforgettable Greek islands vacation or honeymoon. The volcanic explosion of c. 1450 B.C. that shaped the island is considered by some as the source of the legendary Lost Atlantis. The major remains of that period, at the site named Akrotiri, are known as the "Pompeii of the prehistoric Mediterranean". Ruled by Catholic Italians throughout much of the Middle Ages, Santorini later became a home of Greek shipping magnates, and this diverse history has left a legacy of handsome religious and secular structures, while the volcanic eruption left the sheer cliffs that provide unique vantage points for hotels and restaurants. We specialize in five hours private tour in Santorini, with professional English speaking, Hispanic, French, and Italians tour guides, and you will see the whole Island of Santorini. A private tour will last 5 hours, We start the tour at 10 am, if you come from a cruise ship, We will meet you on top of the cable car. We will be waiting in front of the cable car holding a sign with your name on. 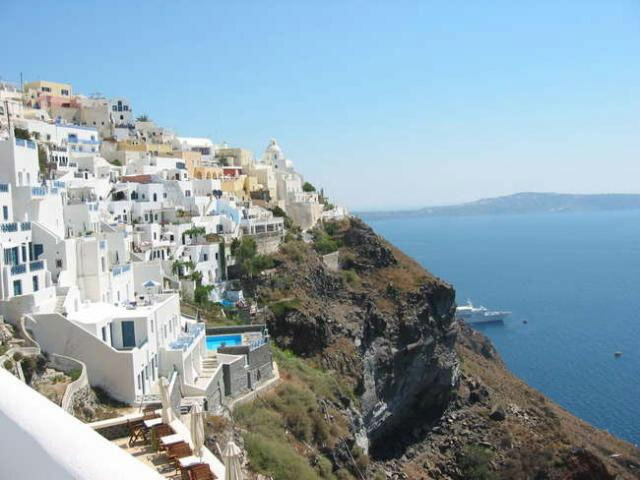 Among other places you will visit, will be Oia village that is a dream for every photographer and Fira town that have amazing and breathtaking views,Visit one of the wineries to see the beautiful view of Santorini one more time, please see the web camera below. 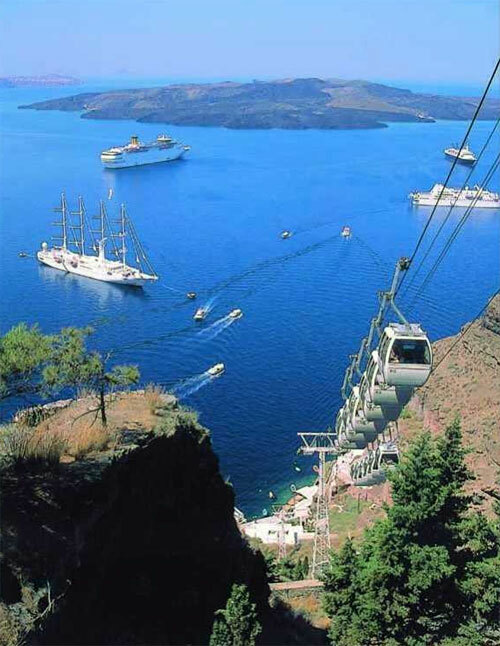 http://www.santoriniweb.com/webcam.html . Stop for lunch if you like at the water front restaurant by the black sandy beach of Santorini . we will drive up to the Prophet Elias Monastery mountain and you will see the whole Island from 1000 meters height. This is a five hours program but is not a fixed program as our aim is your pleasure so upon your arrival, we will make the program you thing is the best for you and your family. You will see the entire island you will just decide where you want to spend more time and in the meantime you can shop, swim, have lunch, visit archeological sites if open and do anything you like. Please note that Akrotiri will remain closed! If you wish to know more about this tour please send us an e mail at info@greeceprivatetours.com and we will answer with in 12 hours the most. In order for us to book a private tour in Santorini we require 30% of the total amount and you will pay the balance in cash euro or credit card after the tour. Once I will receive the booking form, I will confirm your tour. Please inform us the final number for passengers at least 1 week before the tour. As for cancellation policy, if you cancel the tour 3 day before, you get all your deposit back, or if the ship don't come to Santorini because the weather, you will not charge for anything. If you cancel one day before or if you don't come for the tour you will loose your deposit. We will not charge the whole amount of the tour. From 20 to 30 people, the cost of a private bus tour for your group only, will be 40 euro per person. For 30 people and up, the cost of a private bus tour for your group only, will be 30 euro per person. Renew your wedding vows from 500 euro! 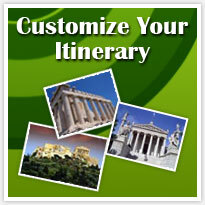 This offer is only for cruise ship travelers. Meet guide at pier and then board a private boat for your group and cruise out to the Volcano. There you group will have time to hike the volcano and see the beautiful views. Following which the boat will take your group to the thermal/hot springs where they will be given time to swim. Following the tour to the springs and the volcano, your group will return to Fira. Your guide will then take you up the cliff to the town for a tour and free time for lunch and shopping. Following lunch you will board your private coach/van and drive to the beautiful village of Oia. After visiting Oia you will return to Fira where you guide will take you back down the cable car to the pier for your tenders to the ship. We have luxury cars and mini buses available so we can accommodate from 1 person to groups! We have luxury mini-vans, coaches - buses and a crew of well trained drivers and guides that are locals and share the same love as mine for this unforgettable island! Everybody is welcome and I will personally make sure that this tour will be a tour you will never forget!